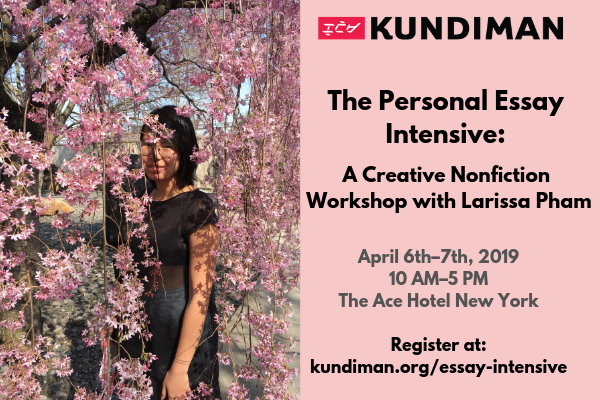 Building upon our tradition of Creative Nonfiction Intensives, Kundiman is excited to present our first Personal Essay Intensive with Larissa Pham! This two-day creative nonfiction workshop will emphasize how to write from one’s life, as well as how to conduct research to strengthen themes within a piece. The Personal Essay Intensive will be limited to 15 participants and will be held at The Ace Hotel New York’s Boardroom. Thank you to The Ace Hotel New York for their support of this event! The cost for this two-day workshop is $250, and there is a scholarship available. This class is open to all writers who identify as Asian American. Please e-mail info@kundiman.org with the subject line [Personal Essay Intensive Scholarship] with a brief paragraph on why you are interested in this workshop, as well as why you are seeking a scholarship and your yearly income. Scholarship submissions will be accepted until March 24th. Larissa Pham is an artist and writer in Brooklyn. Her essays and criticism have appeared in The Paris Review Daily, Poetry Magazine, Bookforum, Guernica, The Nation, Rolling Stone, Village Voice, Verso, Adult Mag, New York Magazine, The Rumpus, Garage, Broadly, Packet Bi-Weekly, and elsewhere. Her fiction and poetry has been published in Triangle House and Shabby Doll House. She is the author of Fantasian (2016), a New Lovers novella from Badlands Unlimited. In 2017, she was an inaugural Yi Dae Up fellowship recipient from the Jack Jones Literary Arts Retreat. Previously, she worked in messaging and communications at the New York City Anti-Violence Project, focusing on providing support to LGBTQ and HIV-affected survivors of hate violence and intimate partner violence. She teaches at the Asian American Writers Workshop in New York City.